Great to see you videoing again Jools. 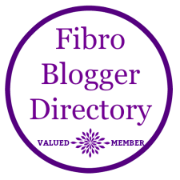 You asked for suggestions to talk about - I would love to hear about when you first realised you had Fibromyalgia and what your first symptoms were. Thanks for supporting Fibro Friday. My Fibro Fog is so much worse in the evenings, I manage to be on top of nearly everything throughout the working day but at home in the evenings, I loose words mid sentence, tell my husband I'll do something in a minute and totally forget or even put bread in the toaster and find it later when it is cold... I enjoyed your video I hope to progress to videos as well as blog posts one day. As for helping me to remember I have Remember the Milk on my PC and phone for quick jobs like ordering meds. I have Trello to manage projects I hope to do and I have anything that has to be done at a certain time on my Google Calendar which is on my phone as well as my Computer so if it is important I tend to be in control and organised, it is just those silly things like, pass me the ..." that get absorbed in the fog.